It may be a bit confusing if you never loaded in new sounds via midi so we have put a tutorial together on exactly how it’s done. When you purchase any of our sounds in Macintosh format you receive the files in both system exclusive (.syx) and standard midi (.mid) files. This gives you a wider option as to what programs you can use to load the sounds. There are many programs that you can use to load the files including DAW programs such as Logic, Cubase or Digital Performer. 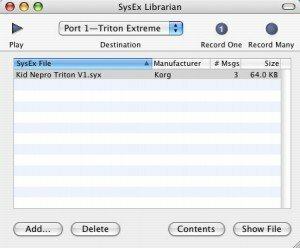 We also provide a great program written by Kurt Revis (www.snoize.com/) called “SysEx Librarian” that will do all sorts of cool stuff including load both system exclusive and standard midi files. Make sure you “Save” your internal sounds to disk before loading in our sounds. Our sounds will replace your internal presets, so it’s best to save them to disk so you can reload them in later if you wish. Many synth have a “re-initilize memory” setting which you can use to restore the original factory settings, so if you have one in your synth there is no need to save your factory sounds (if you have not changed anything). 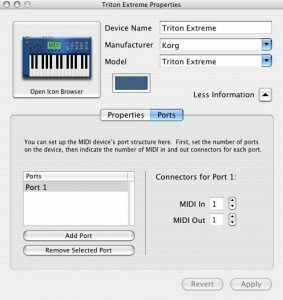 First connect your midi cables from your midi interface to the synthesizer. Remember that your synth must first be set up to receive data via midi. Each synthesizer is set up differently, so refer to your owners manuel on how to transmit a “Bulk Dump” or “Sysex Dump” from your synth to your computer. Some synths require you to turn off the memory protect. Others require you to “enable” or “turn on” the system exclusive. It varies from synth to synth. 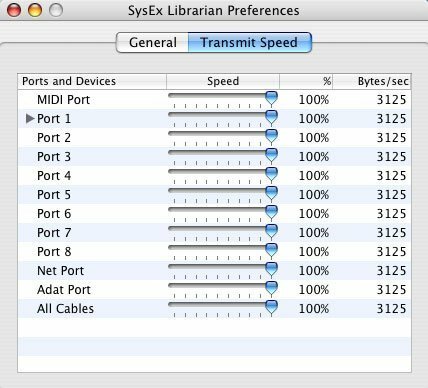 Before you boot up the sysex librarian you have to set up your instrument(s) in the Mac’s “Audio/Midi Setup”. The Audio/Midi setup can be found in the Utility’s folder inside the Mac’s Application folder. Open up the Audio/Midi setup and click on “Midi Devices” (if you using OS 10.4 or earlier). If your running OS 10.5 or later then go to the “window” menu and choose “show midi window”. You should see your midi interface in the window. 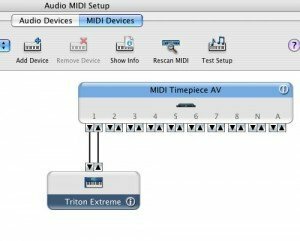 For our example we are using a Midi Timepiece AV as the midi interface and a Korg Triton Extreme as the synthesizer we want to load the new sounds into. Click on “add device” and a icon will appear that say’s “new external device”. Double click on the icon and the “properties” box will pop up. Give the device a name, choose the manufacture and model and fill in the midi channel info. 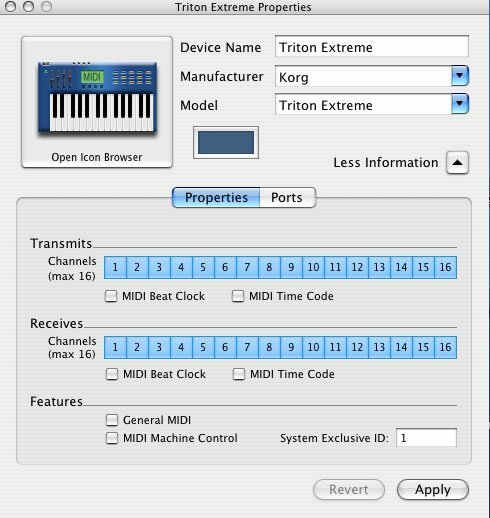 The “system exclusive” ID, in the bottom right corner is the setting for the midi channel that you have your synth set to. Note that if you happen to have a synth made by Roland: midi channel 1 is actually channel 17, midi channel 2 is channel 18 and so on. Once you create your settings, close the properties box and go back to the main Audio/Midi box. Then as in the top photo, you have to connect your midi interface to your synth with the patch cables. Just click and drag to connect the two. Connect both the “out to in” and the “in to out” just as in the first photo. 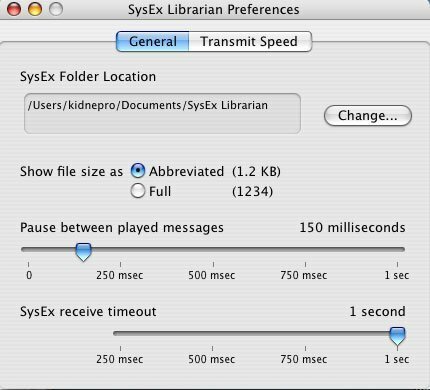 Close the Audio/Midi setup and open the SysEx librarian. In the pull down box choose the port that you have your synthesizer connected to. In our example we are using port 1. 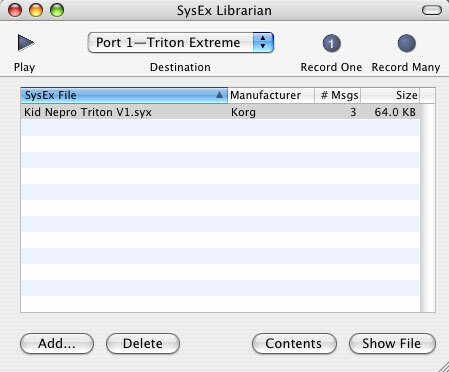 Then just drag the sysex or midi file from your desktop into the SysEx librarian box and you should see the name appear in the box (Kid Nepro Triton V1.syx). Then just hit the “play” button and if everything is connected properly the data should load into your synth. 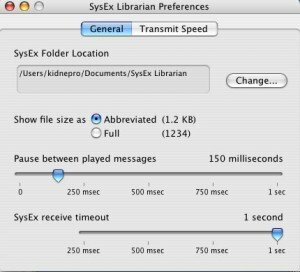 From the SysEx librarian docs: Transmit Speed: Most MIDI devices can handle sysex messages sent at full speed, but a few older ones have problems keeping up. If your device doesn’t work, try turning down the transmit speed a little bit. 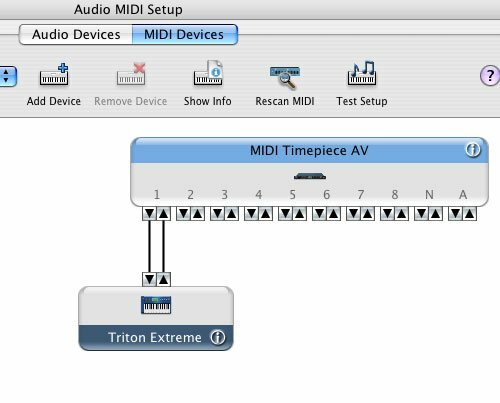 (this is done in the sysex librarian preferences) Note that you can change the speed on an individual device, if you’ve set it up in Audio MIDI Setup. 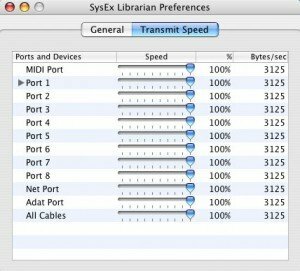 This is the recommended way to do it (instead of setting the speed on the whole output port), because SysEx Librarian will use the appropriate speed even if you change which port the device is hooked up to. If you’re having problems, your first step should be to get the latest version of the driver for your MIDI interface. Almost all manufacturers have web sites where the drivers can be downloaded — please check with the manufacturer of your particular device. You must have a Mac OS X driver for your MIDI interface; Mac OS 9 drivers will not work. Something happened to where my triton extreme loads up differently. It used to load with the keyboard A001, and now it loads with the fast synth A000…Please help!!!!! 4years of work down the drain…Is there a way i can go back or what changed this ??????????????????? Thank you a lot man. Finally I have conection between dx7 and mac. I have both the librarian program and the midi monitor going, the monitor is reading activity from the weave station. i turn down the transmit speed because of an older unit. screen replaces battery replaced card replaced unit shows 100% transmit.